(Photo: © Peter Williams / WCC)Pope Tawadros II, patriarch of the See of St. Mark and leader of the Coptic Orthodox Church visited to the World Council of Churches on Sept. 1 2014. The heads of the Coptic, Syrian, Armenian and Indian Orthodox Churches have held ecumenical prayer with the Evangelical Church in Germany in Berlin for Christians in the Middle East. For the first time, Pope Tawadros II, Patriarch of the Coptic Orthodox Church of Alexandira; Patriarch Ignatius Afrem II of the Syriac Orthodox Church; Catholicos Karekin II, supreme head of the Armenian Apostolic Church and Catholicos Baselios Morthoma Paulose II, Supreme Head of the Malankara Indian Orthodox Church visited Germany together. They were there to inform political and church representatives on the bad and sad situation in the region where Christianity originates. For the Berlin Dome it was a historic moment on Oct. 21. "Never in the 112 years history of this Evangelical church building in the center of the German capital has the colorful variety of Christian faith been more obvious," wrote Katja Dorothea Buck a journalist who covers religion and politics in Germany. "Prayers, lectures and hymns were performed in Aramaic, Syriac, Armenian, Coptic, English and German. Ethiopian, Armenian, Syrian and Coptic church choirs contributed with their respective liturgical music. Bishop Heinrich Bedford-Strohm, chairperson of the Council of the EKD, the alliance of German Lutheran and Protestant churches said, "It's a great honor for the Evangelical Church in Germany that the four Oriental churches accepted the invitation to come to Germany to commemorate the Reformation, to share their suffering and to pray with us,"
He reminded the faithful that the Oriental churches have a presence in Germany through their local communities. "Today 250,000 Oriental Christians are living among us and the Oriental churches are engaged in a tremendous effort keeping their identity on the one side and in integrating the people into German society on the other." German Bishop Gerhard Feige who represented the Catholic Conference of Bishops in Germany reminded people of the big differences in the realities of the life in the Western world and in the Middle East. "We in Germany are not subject daily to violent attacks. Many Oriental Christians must hear differently the Beatitude 'Happy are those who are attacked on account of righteousness; for the kingdom of heaven will be theirs'. Jesus promised those who follow him persecution," said the Catholic bishop. "If there were no Oriental church anymore in the Middle East we in the Western world would severely miss something essential. Their liturgies, their traditions and their respective history are a precious gift." Syrian Patriarch Ignatius Afrem II thanked EKD for the invitation which gave the patriarchs the opportunity to discuss over four days what his church faces with political leaders and representatives of the churches in Germany. "Thousands of people have been killed. Many people had to endure martyrdom. Hundreds of churches were destroyed. We are grateful that we were able to tell our story," the patriarch said. He reminded the 800 people in the dome the fate of the two Syrian bishops kidnapped extremosts in April 2014. "We are thankful to be invited to celebrate with the German Evangelical Church the 500 years of Reformation which brought many positive elements," Afrem noted. "The Reformation reminds us all to be faithful in the Gospel. But it also brought division in the body of Christ." In 2017 Chrisitans are commemorating 500 years since priest Martin Luther nailed his 95 protests to a Wittenberg church against wrongdoing in the Catholic Church to start the Reformation. In the 18th and 19th century Protestant missionaries came to the Middle East to evangelize among the Orthodox faithful and created new churches, he explained. Karekin II, the Armenian Catholicos, emphasized the guidance the Beatitudes give in times of confusion. "When religious intolerance and conflict become part of the daily lives of innocent people; when murder and persecution are part of fundamentalist ideology; when the destruction of old religious cultural values and the forced expulsion of people from the cradle of Christianity are justified through falsified and corrupted religious messages, Jesus recalls us again to join and to follow him in his footsteps." Indian Orthodox leader Baselius Marthoma Paulose II remembered the long relations between his church and the Oriental churches in the Middle East. He said their common roots enabled people in South India to be able to side with their sisters and brothers in the Middle East. Due to health problems, Coptic Pope Tawadros had to cancel his participation at the prayer service. Bishop Damian from the Coptic diocese in Germany spoke in his place. 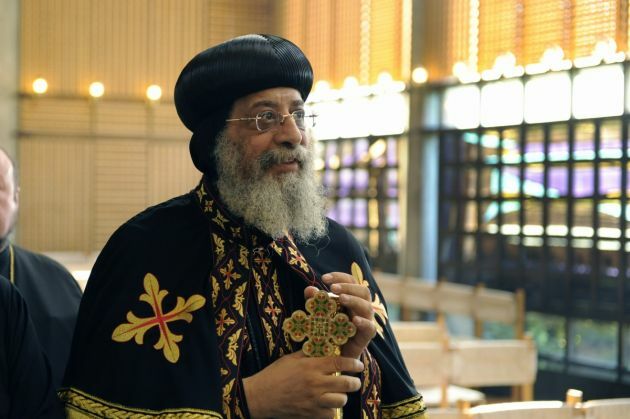 "It is good to talk with us instead of talking about us," he said quoted Pope Tawadros. "If one day there were no Christians anymore in the countries around the Mediterranean, peace and stability in the region and in the whole world would be in danger."